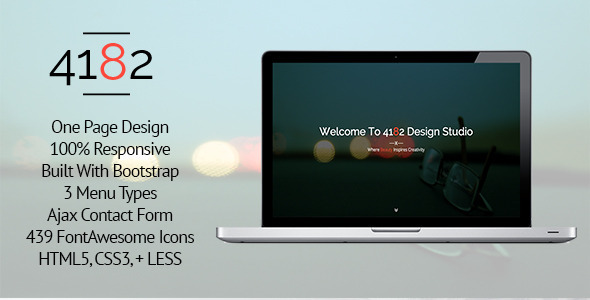 4182 is a minimal, clean and responsive one page HTML5 template that has been build on Bootstrap 3. This template features an AJAX contact form and portfolio. 4182 also uses the Font Awesome Icon Pack with 439 Font Icons, and is simple, elegant and customizable. This entry was posted in site-templates and tagged ajax, clean, contact form, creative, css3, html5, isotope, minimalistic, modern, portfolio, simplistic, working by Acty. Bookmark the permalink.